A salon formula Ideal for waxing the eyebrows, upper lip and chin. Available in a 6g tube, offering 20 treatments. You won’t need to wish for meticulous brows with Waxaway’s Precision Wax Wand! Its unique precision tip applicator applies the perfect amount of salon formula wax and provides comfort and control when shaping brows or removing facial hair. Simply twist the wand to apply wax precisely where needed. Even more magical, no preparation is required, so you can have a professional result in a matter of minutes. spell is in the wand! 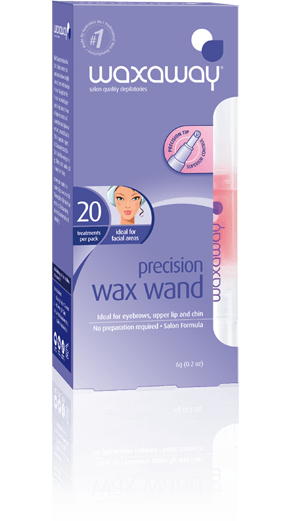 Twist Wax Wand to remove pressure. Determine direction of hair growth then slowly and firmly apply a thin layer of wax in direction of hair growth. Place a salon professional wax strip over and press down firmly. Ensure skin is taut with one hand and with the other, grip on to the edge of the strip. Pull back quickly in the opposite direction of hair growth as close to the skin as possible.